Kibo eCommerce has updated its terms and conditions to comply with General Data Protection Regulation (GDPR). Additionally, Kibo now offers services for obfuscating/deleting customer data for shoppers that request their data to be removed, as required by GDPR. Kibo eCommerce now features updated terms and conditions on the checkout page that includes a section explaining GDPR. Shoppers must agree to all terms and conditions before they can submit their order. 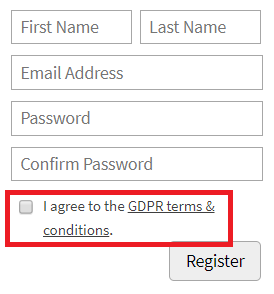 When a shopper creates an account, the storefront page displays a checkbox requesting them to agree to GDPR terms and conditions. Shoppers are required to select this checkbox to successfully create an account. By default this link points to https://kibocommerce.com/privacy/, but you can update this URL to your own terms and conditions page. For more information, refer to Enable GDPR Storefront Changes section below. Send a request to Kibo Support. Kibo then sends you a report (in a password protected file) that details what data will be affected. Reply to Kibo Support and confirm that the data listed in the report is the data you want to delete/obfuscate. Upon receiving confirmation, Kibo starts deleting/obfuscating the data listed in the report. This feature requires changes to your core theme. Ask your theme developer to make the required changes to your theme to enable this feature, as detailed in the Github pull request.